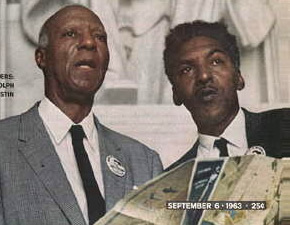 On August 28 it will be 50 years since the March on Washington for Jobs and Freedom, which remains one of the American Left’s most successful mobilizations ever.Â More than a quarter-million people came to the Washington on August 28th, 1963 to protest discrimination, joblessness and economic inequality faced by African Americans. The march is widely considered to be a key turning point in the civil rights movement. A mass, multi-racial dissident act, it is best remembered for Martin Luther King’s I Have A Dream speech, and in the videos below Democracy Now investigates why this is the case, how and why the speech is often misunderstood, and other aspects ofÂ much of the march’s forgotten history. Gary Younge, columnist for The Guardian and The Nation, and author ofÂ Â author of The Speech: The Story Behind Dr. Martin Luther King Jr.’s Dream,Â argues that after 1963, King’s start began to wane when he started to talk about class, poverty and the Vietnam War. The reason King is remembered for this speech, he says, is because can’t remembered for saying that America was the greatest purveyor of violence in the world. He has to be remembered as someone who defined one of the greatest moral moment in American history. Today the speech is misunderstood as an artefact, instead of what it is – a living, breathing document that still speaks to the realities of America today. William P. Jones, a history professor at the University of Wisconsin Madison, is a specialist in the histories of race and the American labour movement. He argues that by the time Martin Luther King came to the podium, there was no need for him to reiterate the specifics of the March on Washingtonâ€™s agenda, which may explain why his speech proved so appealing to moderates.Â Â Jones’ latestÂ whose latest book, which has just been published, is calledÂ The March on Washington: Jobs, Freedom and the Forgotten History of Civil Rights.Â His latest article in Dissent is titledÂ The Forgotten Radical History of the March on Washington. Democracy Now!, is an independent global news hour that airs weekdays on 1,200+ TV and radio stations Monday through Friday. Watch it live 8-9am ET atÂ http://www.democracynow.org.